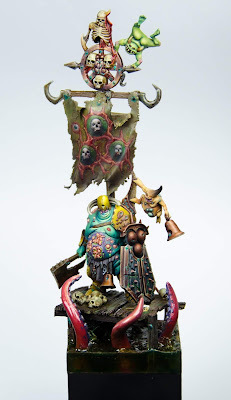 Nurgle models tend to offer a lot of creative freedom to painters, and this mini is a great example of that. I love the color choices on this! It's definitely outside of the norm for what you would typically find for Nurgle, be still works thematically. The bright yellow armor works great with the almost jade tone on the skin. Both of these are offset wonderfully by the pinks and fuchsias of the open wounds and tentacles on the base. Your eye really moves around the model as you travel from one color to the next. Everything is really smooth and crisp as well, with just the right amount of weathering to signify the Nurglyness of it without muddying up the bright colors. The only thing that feels a bit off to me is the banner. It's painted wonderfully, but the drab green color of the cloth is such a stark departure from all of the other bright colors. 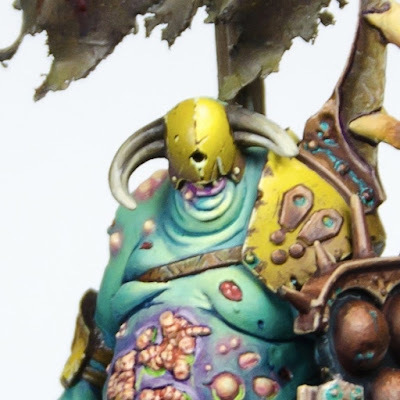 It's the most "Nurgle" of all of them, but doesn't really gel with the vibe of the mini as a whole. I don't think it's overly distracting though, and it certainly ties in with the muddier colors of the base, essentially framing the Lord of Blight between the two. The addition of the Nurglings climbing over him is a nice touch as well.